A sprained wrist can put a real damper on your lifestyle. In the first several days when the pain is at its worst, it can even limit your ability to do daily tasks like cooking, typing, or possibly driving. Although most sprained wrists eventually heal on their own, you must be careful during the later stages of recovery to avoid re-injury. Avoiding re-injury of a sprained wrist requires starting treatment immediately and completely resting your wrist for a period of time. If you don’t control inflammation and immobilize your wrist after the injury, the risk of a prolonged recovery increases, and the damage to tissues is more likely to worsen. If possible, apply ice to the wrist immediately after the injury has occurred and wrap it in a bandage to apply consistent pressure and prevent excess swelling. This quick first aid can go a long way toward a faster and safer recovery. One of the most common mistakes people make when recovering from an injury is returning to activity before it has fully healed. This is particularly true for a sprained wrist, because the joint is used so much in normal daily activities. However, bearing too much weight on your injured wrist before it has fully healed can result in re-injury. Although it might be tempting to push your limits after the pain has subsided, it’s important to wait until you have regained full range of motion and all of the damaged tissues have repaired themselves. Even after a full recovery, it’s important to realize that you will have to build up to your previous levels of strength, flexibility, and range of motion. If you are working with a physical therapist, ask him or her what is safe for you to do and what activities you should build up to. He or she can also provide strengthening and stretching exercises to help you safely return to your normal lifestyle. 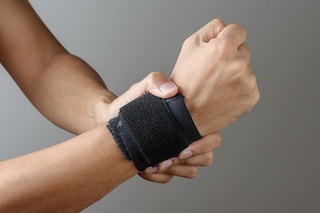 This can be an especially difficult time for athletes, because although the wrist is not supported by major muscle groups, it plays a major role in gripping for activities like lifting weights, playing hockey, or holding a tennis racquet. Throughout the entire recovery process, applying cold therapy and compression will help reduce inflammation and control pain without the need for medication. These are important basic steps, but you can make cold and compression treatment much more effective with the use of a cold therapy system. By incorporating active compression, therapeutic cold is able to penetrate deeper and last longer. Deeper penetration means that all of the damaged tissues get the benefits of cold therapy, not just those that are closest to the surface of the skin. This contributes to faster and more effective healing so that when you do return to activity, there is less risk of reinjury. If you have a sprained wrist, avoid re-injury by starting treatment early, waiting until you are fully recovered to return to activity, taking it easy when you do, and using a cold therapy system to support deep tissue healing. Contact Game Ready anytime to learn more about how to get a cold therapy system for your wrist injury recovery.